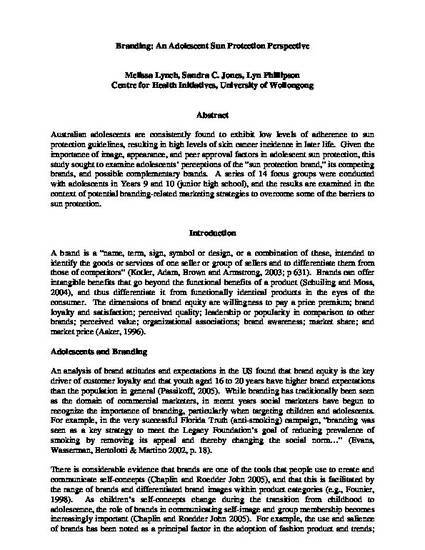 This conference paper was originally published as Lynch, M, Jones, SC and Phillipson, L, Branding: an adolescent sun protection perspective, Proceedings of the Australian and New Zealand Marketing Academy (ANZMAC) Conference, 2007,1662-1670. Australian adolescents are consistently found to exhibit low levels of adherence to sun protection guidelines, resulting in high levels of skin cancer incidence in later life. Given the importance of image, appearance, and peer approval factors in adolescent sun protection, this study sought to examine adolescents’ perceptions of the “sun protection brand,” its competing brands, and possible complementary brands. A series of 14 focus groups were conducted with adolescents in Years 9 and 10 (junior high school), and the results are examined in the context of potential branding-related marketing strategies to overcome some of the barriers to sun protection.